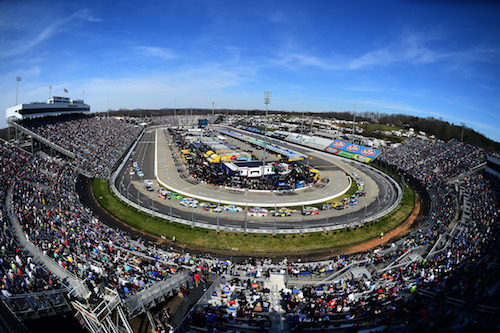 during the Monster Energy NASCAR Cup Series STP 500 at Martinsville Speedway on March 24, 2019 in Martinsville, Virginia. 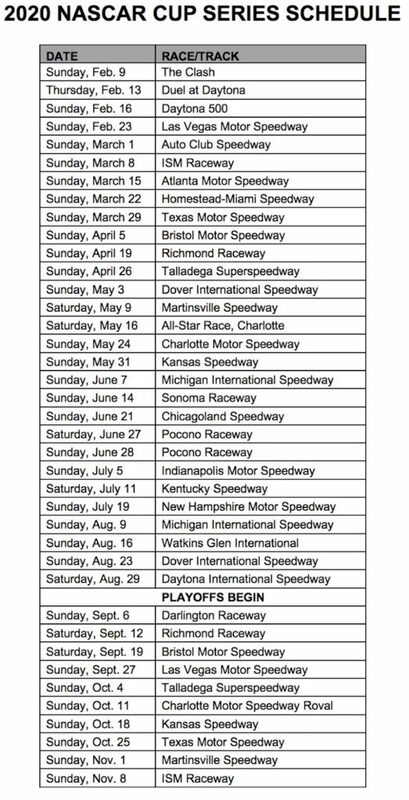 NASCAR announced Tuesday its 2020 Cup Series schedule with significant changes that include a Pocono Raceway doubleheader, new locales for the season finale and the regular-season finale and the first scheduled series night race at Martinsville (Va.) Speedway, among other changes. The regular season will both begin and end at Daytona (Fla.) International Speedway, with the traditional July 4 weekend race there moving to Aug. 29 to make room for the Brickyard 400 at Indianapolis Motor Speedway move to July 5. The 2020 champion will be determined at ISM Raceway near Phoenix instead of Homestead-Miami Speedway on Nov. 8. The Homestead race will move to March 22, the sixth race of the season. Meanwhile, Atlanta Motor Speedway’s date moves from the second race of the season to the fifth (March 15), following the West Coast Swing, which moves up a week. Pocono’s traditional two race weekends per season have been condensed to one weekend for a Cup Series doubleheader of races on June 27 and 28. Also, the Cup Series will go night racing at Martinsville (Va.) Speedway for the first time on May 9, Mother’s Day weekend. Meanwhile the Bristol (Tenn.) Motor Speedway night race moves to the playoffs to conclude the opening round, which will begin with the Southern 500 at Darlington (S.C.) Raceway. With Bristol’s move to the playoffs, all three short tracks that host Cup Series races will have playoff dates. Martinsville’s playoff race will move the the penultimate weekend of the season, the old ISM Raceway date.